Videos on how to order Foreign Military Studies and microfilm from the US National Archives web site. The videos are in HD 720p; you may have to switch to that resolution manually. Below is a guide that will help with ordering FMS and microfilm from the US National Archives. A search tool for those that collect or search for NARA German document rolls. Before I order from NARA I check to see if the roll I need is availble from a more reasonable source. 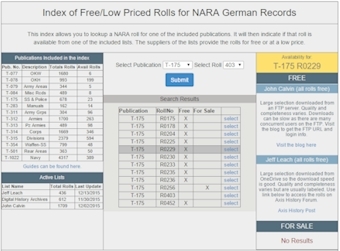 This tool allows you to search for a specific roll to see if it is available from one of the included free or low priced sources. The guides on this page are from Publication T733. Below are guides 1-99 (less 89) from Publication T733. By default all guides will be listed and sorted by guide number, to view a specific category of the guides use the menu located on the left.